I am currently in a breakfast phase where all I want to eat is muffins. 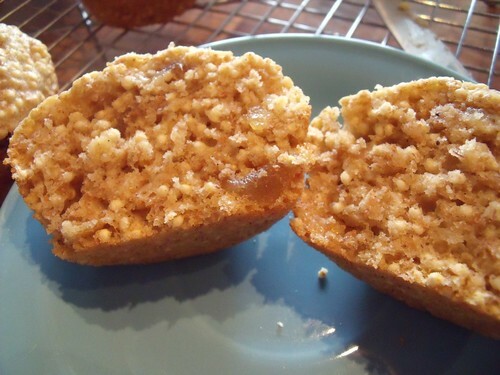 Last week they were Meghan‘s Vegan & Gluten-Free Apple Cinnamon Muffins (yum! ), and this week I wanted something with even more fall spices: cinnamon, nutmeg, vanilla, and crystallized ginger are my go-to fall baking spices, and they are great in these muffins. I found this recipe months ago, and added it to my “To Eat” list. 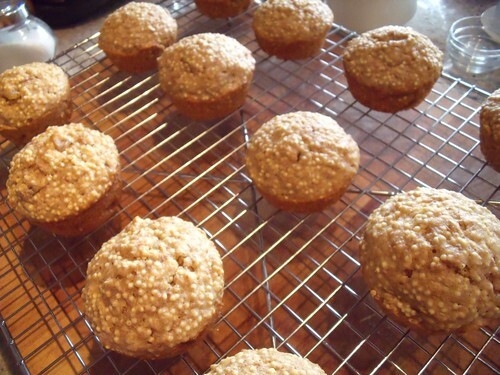 Every time I looked over the list, these muffins would pop out at me and say: “Crunchy Millet! You need me!”, and so I had to give them a try this morning. 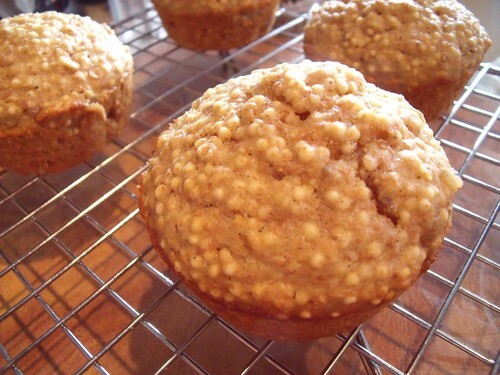 The crunchy (uncooked) millet is indeed a great add to muffins. I love the fact that I am getting another serving of delicious whole grains in, and it is a great match to the spicy sweet hit of crystallized ginger. Yum. I think these muffins would be divine with a schmear of almond hazelnut butter, but I ate two of them plain this morning, fresh out of the oven. So did the boyfriend, so they’ve got the official seal of approval (although, apparently he “would have eaten three if they had chocolate chips”). Enjoy! In a large bowl, combine Dry Ingredients, and set aside. In a separate bowl, combine Wet Ingredients , mixing well. Add Wet Ingredients to Dry Ingredients. Stir to incorporate evenly. Add in chopped ginger, and stir to combine. Grease a muffin pan with coconut oil or butter. Distribute batter evenly between all 12 muffin cups, so they are all 3/4 full. I like to use an ice cream scoop for this step. Bake at 350F for 25 minutes, or until the muffins are golden brown and a toothpick or knife inserted into the centre comes out clean. Let cool and eat with crunchy joy. I may NEED to adapt these to be gluten free because crystalized ginger is one of my favourite things of life!! I didn’t know that!!!! It’s one of mine, too … and I know Louise also loves it! They’d work out REALLY nicely (along with a flax substitution for the egg to be vegan). Let me know if you give them a go. They’re worth it! can i sub canola oil for the walnut oil? That would be no problem at all. Enjoy! These look fantastic Lindsay. I actually feel silly for never having thought to put millet into baking- as a grain it has such a sweet buttery taste that must be so good in muffins! I think you’d love them!!! Mmmm, the millet gives them this crunchy amazing wonderful texture!!! We just tried these the other day and wanted to let you know how well they turned out. My tiny plastic co-writers and I really liked how filling they were. Warmed up with some Earth Balance on ’em? YUM! ‘Glad you shared ’em.